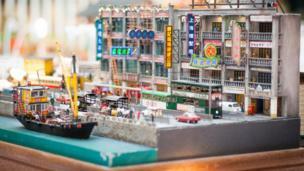 An exhibition of miniature dioramas offers a glimpse into a disappearing way of life in Hong Kong, reports Grace Tsoi from BBC Chinese. After World War Two, Hong Kong saw an influx of refugees from mainland China. Penniless, many of them could only live in wooden huts they built and one of these squatter villages was located at Mount Davis, an area on western Hong Kong Island. 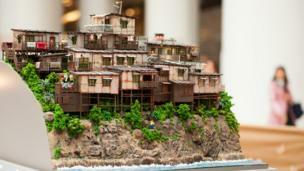 In 1983, a powerful typhoon hit Hong Kong, triggering a landslide in the squatter area. A firefighter was killed during the rescue operation and the colonial government cleared the squatters afterwards. The internet and widely available free newspapers mean that fewer residents buy newspapers and magazines. 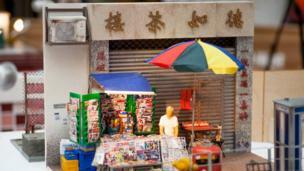 In the 1990s, there were more than 2,000 newspaper stalls – but the number has plummeted to fewer than 400 now. Many of the newspaper stalls were located outside traditional tea houses as diners loved to read their news while enjoying tea and dim sum. Usually occupying the ground floor, traditional tea houses are also on their way out because of the high rent. 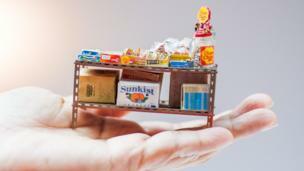 Iron shelves of popular snacks for children - including chupa chups, mentos and potato chips - have been lovingly re-created in miniature form. These shelves are usually seen in corner shops, which also serve as a meeting point for residents, say of a public housing estate. “Tong Lau” literally means Chinese houses, which were built in late 19th century. These buildings are often several storeys high, with the ground spaces occupied by shops. This diorama is a replica of the now-demolished Wing Lok Pier, where a lot of “coolies” laboured and moved goods from ships to nearby warehouses. During Chinese New Year, hordes of visitors go to Lam Tsuen, Tai Po to toss joss paper onto a tree that is believed to have wish-granting power. It is believed that if the joss paper doesn’t fall from the tree, your wish will come true. But in 2005, overwhelmed with the weight of joss paper, one of the branches broke. The government has since forbidden all kinds of joss paper-tossing so that the tree can make a full recovery. Villagers of Lam Tsuen installed a plastic tree instead so that visitors could still enjoy the fun of wish-making. Hong Kong used to be the called “Hollywood of the East” and local movie production peaked in the early 1990s with more than 200 titles a year. Before television and online streaming, movie-going was a popular and affordable pastime for the population. 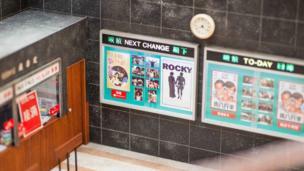 Prospects of Hong Kong’s movie industry now look bleak. There are only about 50 cinemas in the city of more than seven million people and young moviegoers also prefer Hollywood blockbusters to local productions. Many of Hong Kong’s skyscrapers are built using bamboo scaffolding. Bamboo is a fast-growing plant and therefore much more environmentally-friendly; it also offers more flexibility than other materials like steel. While bamboo-scaffolding has become a thing of the past in the rest of the world, the ancient technique is still going strong in the city. 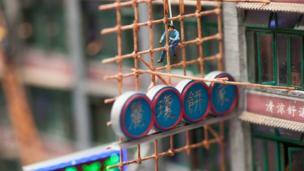 The government issued a code of practice for bamboo-scaffolding, and workers are required to obtain licenses. Consisting of about a hundred flower and plant shops, the flower market in Prince Edward is the mecca for horticulture enthusiasts. Space is perennially scarce in the city and only a small number of people can afford to have a garden – but there is always room for potted plants and flowers. 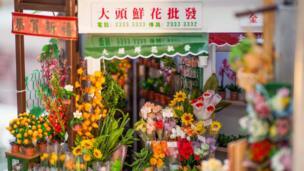 The flower market is especially busy before the Chinese New Year as it is a tradition to place flowers at home – symbols of prosperity and beauty – to celebrate the arrival of spring. Resettlement estates – the first-generation of Hong Kong’s public housing – were built after the Shek Kip Mei shanty town was engulfed by a fire on Christmas night in 1953. The exhibit depicts the life of the lower class in the 1960s and 70s. Many former residents look at that period fondly as money might have been lacking but the community was close-knit and intimate. 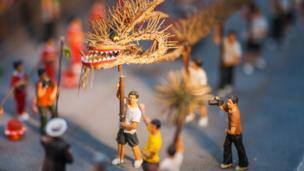 The fire dragon dance in Tai Hang Village dates back to 1880. According to local legend, a huge python appeared in the village after a storm. After villagers killed the python a plague ravaged the village. A village elder was given instructions by Buddha to save the village: they would have to make a dragon using straw, place incense on the dragon, and stage a dance during the mid-autumn festival. Villagers followed these steps and the plague ended. The customs is still very much alive and tourists from all around the globe come to the village to watch the dance during the mid-autumn festival every year. 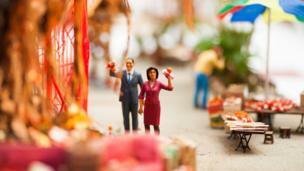 The "Feature of Hong Kong Chinese New Year Miniature Exhibition" will run in Hong Kong until February 22.